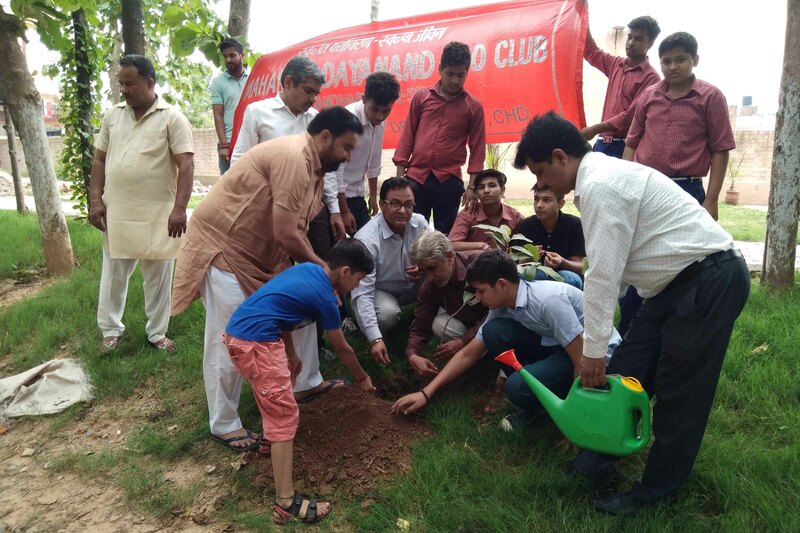 Maharishi Dayanand Public School, Daria, Chandigarh, organized a skit and tree plantation campaign on the occasion of World Population Day in collaboration with the Environment Department, Chandigarh. The children expressed through the skit that continues increase in population could result in imbalance in the environment. Students said that a small family was essential for a clean environment. They conveyed the message that glaciers were melting due to continuous human population on Earth. This would threaten the existence of humans in danger. The environment is being adversely affected due to continuous cutting of trees. Students said that if the population was low then the environment would remain clean. They also stressed upon more planting of trees for cleaner and safer environment. After the Skit, students took part in tree plantation with Pardeep Triveni Secretary of the Triveni Foundation. Acharya Ashok Kumar presided over the program. A Guava trees has been planted in the school while mango and Jamun trees have been planted in the open area of the panchayat. Sarpanch Gurpreet Singh Happy of Gram Panchayat welcomed the initiative of tree plantation take by Maharishi Dayanand Public School and triveni Foundation in the village. Cartosat-2 with 30 nano satellites successfully placed in orbit!